Welcome back to a brand new post on IBeautySpy! 😀 Today I will be introducing you to a new brand I have come across recently – Hydra By Ambika. I won their travel kit in a giveaway and I have been using them for the past 3 weeks. The travel kit contained the following products: Organic Face Cleanser, All Purpose Organic Face Cream, Organic Body Wash, Organic Hand-Whipped Body Butter. This is the Part 1 post where I will be reviewing the face care products – Organic Face Cleanser and All Purpose Organic Face Cream. So let’s get started! 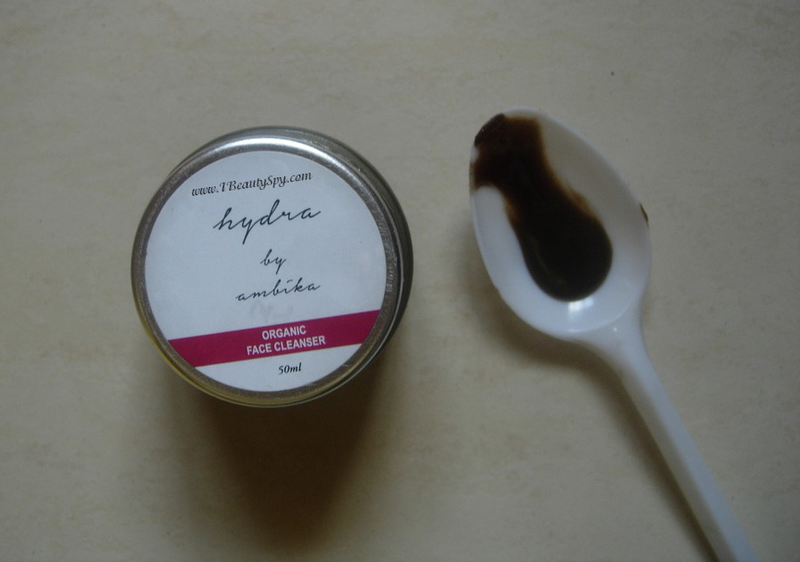 Hydra is home-grown natural skincare brand started by Ms.Ambika. Their mission – to make your skin look and feel good with every passing day. All their products are organic and handmade is small batches. They are free of parabens, sulphates, silicones and all other harmful chemicals. They are also cruelty-free. The packaging of all these Hydra By Ambika products are too good. I got the travel kit which came in a sturdy brown box with the brand’s name written on it. It would surely make a good gifting option. Inside there were 4 frosted glass jars. I love glass packaging and the frosted glass is just too good and renders a luxurious touch to the products. And nowadays we are hearing lot of controversies about plastic containers, that natural ingredients lose their efficacy if stored in plastic ones. So a glass jar is always better. Since this is a travel kit, the jars are smaller. But they also sell individual products in bigger jars. Hydra By Ambika Organic Face Cleanser is a honey-based cleanser with exfoliating clay particles. Quite unique! I have never used such a cleanser before. Honey as we all know is very good for skin as it is anti-bacterial and its great for acne-prone skin. Honey also contains anti-oxidants which help to slow down aging. It also acts as a natural bleach and lightens skin tone. Rhassoul clay helps to pull out all the toxins from the skin. So this is a great combination. 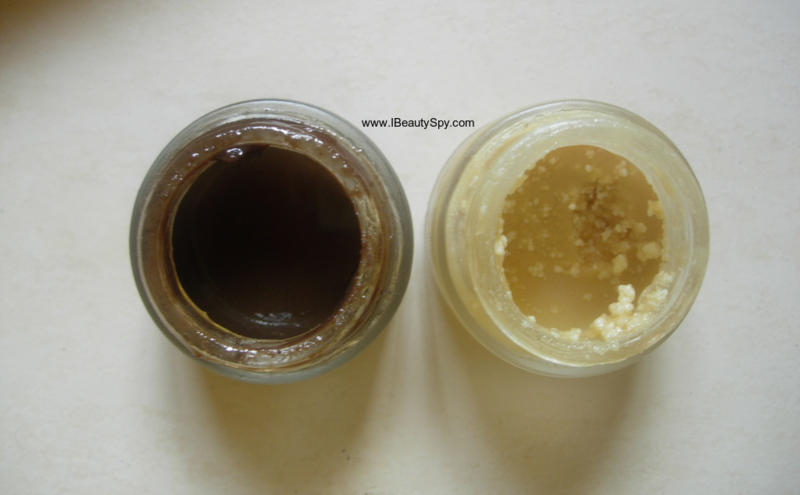 Hydra By Ambika Organic Face Cleanser looks brownish in color. It has a very refreshing, calming scent due to the presence of essential oils. You just need a tiny amount of the cleanser for one use. I massage it on my face and leave it on for around 2 minutes before washing off. After washing, my skin feels so smooth, soft and supple. The clay particles exfoliate the skin while honey and oils helps to cleanse skin. Tea tree oil works on infections and bacteria. If you have oily skin, you can follow-up with your usual face wash afterwards. This can also be used to remove makeup. Hydra By Ambika Organic Face Cleanser has become my favorite cleanser nowadays. And I look forward to using it every evening after I come from office. Hydra By Ambika All Purpose Organic Face Cream is a rich and luxurious cream. Since its an all-natural, hand-whipped cream containing butters and oils, it melts in warm room temperature. It has a relaxing scent of lavender essential oil. The cream is very thick and only tiny amount needed for your face. When it comes in contact with skin, it melts and moisturizes and nourishes the skin from deep within. The lavender oil helps to soothe and calm my skin in case I got any rashes or sunburns. With the onset of winters, my skin becomes dry with white patches around my lips and nose. Hydra By Ambika All Purpose Organic Face Cream has helped me in combating this problem. With regular use, my face has become super soft, supple and deeply nourished. To say in one word, my face looks healthy like never before. It even helps to fade some acne scars and also minimize fine lines on my forehead. Though I have acne-prone skin, it did not break me out. Oily skin people can use this as a massage cream, leave it on for sometime and then wash off to get radiant, glowing skin. Since you need only a tiny amount each time, even this small jar will last me for a long time. Both the cleanser and the face cream are made from certified organic ingredients. I didn’t know this fact until a few days before when I chatted with the founder. But just from the feel of the products on my skin and the richness, I could tell before that they were made from pure, organic ingredients (Side effects of being a beauty blogger and using lots of beauty products, my skin can feel the richness and purity of a product immediately 😀). 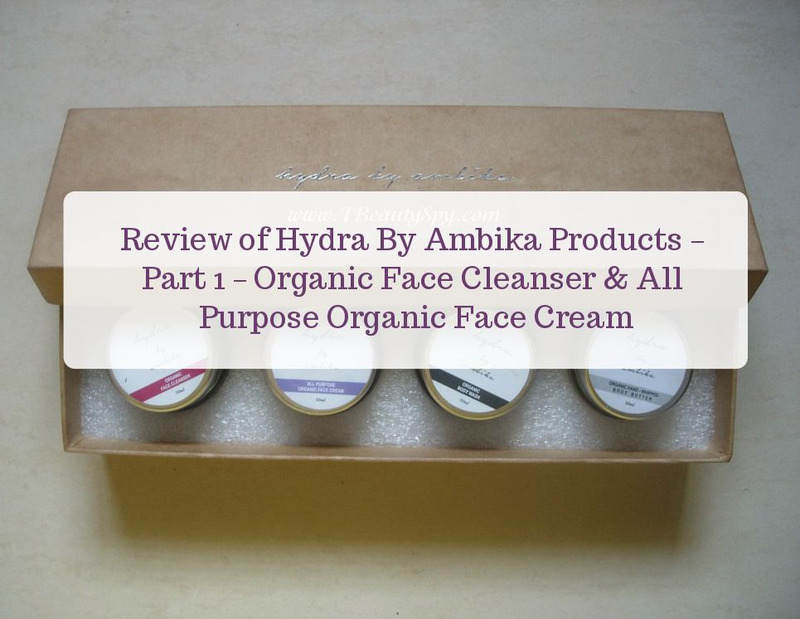 Overall, I loved both the face care products from Hydra By Ambika – Organic Face Cleanser & All Purpose Organic Face Cream. They are one of the best quality, rich, luxurious products I have used. I would definitely recommend them to everyone. You can just vary your use depending on your skin types. Wow both sound amazing especially the Face cream. This is a new brand for me , the products seems good 🙂 Will check the brand . The cleanser sounds quite effective! Hi, You can DM them on Instagram to know the price.